One trend that you're probably starting to see a lot of is mini skirts. Suede skirts, leather skirts, jean skirts.. The common denominator here is skirts! I absolutely love this suede skirt, and a more price-friendly option is the skirt I am wearing here. It is more of a faux leather skirt, but gives you the same look/feel as a suede skirt! I also bought this skirt in black because I loved it so much. The styling options are endless with these mini skirts- I can't wait to show you all the fall looks I have planned with them! Also! In case you didn't already know, the Shopbop Sale Event starts today! Now through Friday, if you spend under $500 you can use code EOTS17 to take 20% off your order! Or if you're a big spender and spend $500+ you get 25% off your order! Just don't forget to use code EOTS17. Love the bell sleeves on you, they just look weird on me! I have been low key obsessed with mini skirts lately. They look so cute with OTK boots, too! Love the white sweater and sleeves! I really need to try the mini skirt trend for the fall. Living in Florida, they are perfect! Love a good mini skirt, especially for fall! This one is adorable and will be perfect to pair with OTK boots and chunky sweaters! That is such a cute outfit. The mini skirt will definitely work in Houston's weather! I love this entire outfit! Those bell sleeves are so adorable! I am absolutely in love with this outfit, especially the skirt! It's so perfect for fall!!! I love that mini skirts and denim skirts are coming back into style! This outfit is so cute! I'm up and down so much in my job I can't think about wearing mini skirts but they are so cute! Especially this one! Your hair is so pretty! Can't wait to rock more mini skirts this fall! I love the skirt too! The look is so fun and stylish and the color is perfect for fall! That outfit looks so cute on you! Great look for fall! I love suede minis for fall! So excited for the temps to drop so I can wear my minis with boots! 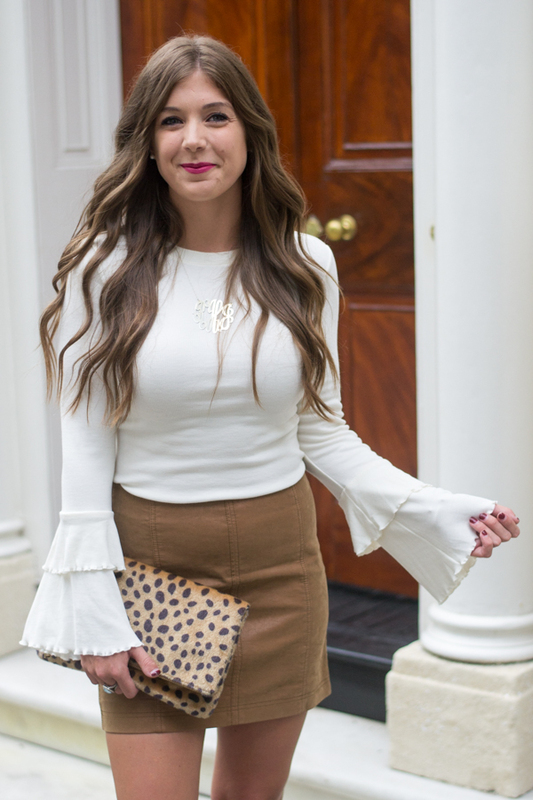 Absolutely love this mini skirt for fall! too cute! Love that skirt! Such a perfect fall outfit.